Welcome to April! I just wanted to give you a run down of what’s to come- this month, and beyond! April is an awesome month to join my team. Get all the tools and materials you need to start your business and hit the ground running. It comes in a bright and happy pink box of goodness. There’s over $200 in product in that bright little nugget, and it’s yours for just $95. But wait. In April only, you’ll also get May, June, July and August’s stamp of the month’s- a $92 added value- as part of your consultant kit. 100% free! No one else is eligible, only new consultants! The rest of us have to wait until the month they’re available to purchase them. In the graphic above, you’ll see all the items that’s included in your consultant kit. Underneath our micro tip scissors is a pink envelope. Inside it, you’ll find an additional bonus- and extra $60 to spend on whatever you’d like! That’s your CTMH cash- something you can earn and collect with the orders placed on your website. Shopping is made so easy with all this free product and extra spending money! Are you a former consultant? We haven’t forgotten about you. We’d love for you to join the CTMH family again, so this deal extends to you, as well. If you’d rather not order the entire consultant kit again, that’s ok. You don’t need to! You can sign up again kit free for $65 CAD. You’ll still get all four stamps of the month AND the $60 CTMH cash shopping spree. Seriously, you can’t go wrong with $60. What else is happening in April? Well, maybe you’re not ready to sign up as a consultant. That’s totally fine. Maybe hosting your own Home Gathering is more your speed. When you reach the third level of hostess rewards, you’ll be able to choose one of the stunning Cut Above kits for yourself. You’ll still qualify for your 50% off items, as well as all the other free product you qualify for. Not ready to host your own party? Ok, how about Flash Sales every weekend through the month? Yes, that’s right. There will be a new flash sale starting each Friday and ending 24 hours later. Save big on current and retired items each and every weekend! April is the last month to take advantage of the current Seasonal Expressions catalog. May 1 heralds a new Seasonal Expressions catalog, and lots of fabulous new products. How about a sneak peek?! Keep your eyes peeled for the rich colours and deliciousness known as Beautiful Friendship. I’ve always loved wood veneer accents, and this kit has it! The seasonal expressions 2 catalog goes live May 1. Contact me to reserve yours! Getting back to you took way longer than I anticipated. Life. It’s a wonderful thing, isn’t it? Here’s what I wasn’t able to share with you earlier. Remember this layout? I created it using a mixture of Whimsy and Basics Fundamentals. The coordinating Whimsy complements and our stamp of the month, Bloom & Grow, made sneak appearances, too. Since it’s been so long, you may not remember the post where I shared the Gimme Some Sugar layout and the promise I made in that post. View it here. The coordinating set to Gimme Some Sugar comes from the Kitchen Traditions Cut Above kit! Available as a set or separately, preserve your cherished recipes and their authors in this stunning collection. The price may seem daunting, but it’s worth every penny. It’s actually a great deal for all you’ll get with it. Aside from the recipe cards (sixty 4×6 cards), page protectors (10), stickers (2 sticker sheets) and Bashful Everyday Life album, you’ll also receive the coordinating stamp set, which on its own is over $20! Great value, if I do say so myself. Kick off National Paper crafting month with CTMH Love Letters. It comes as a kit and includes flower die cuts, rose gold accents, sturdy chipboard letter bases and letter stickers. Choose any letters you want; purchase 5 and get the 6th free! OR, join my team and it’ll be added to your consultant kit- whichever kits you choose! I think that’s great incentive for joining! Thanks for your patience and joining me today! I used some new paper in this layout! The heart patterned paper is from the adventure Fundamentals Paper Packet. They’re currently on sale this month, too! Get it while it’s hot. 40% off the entire suite; 30% off individual items. November 30 is your last chance to snag them at such a great price. If our Cut Above line is more your speed, check this deal out! 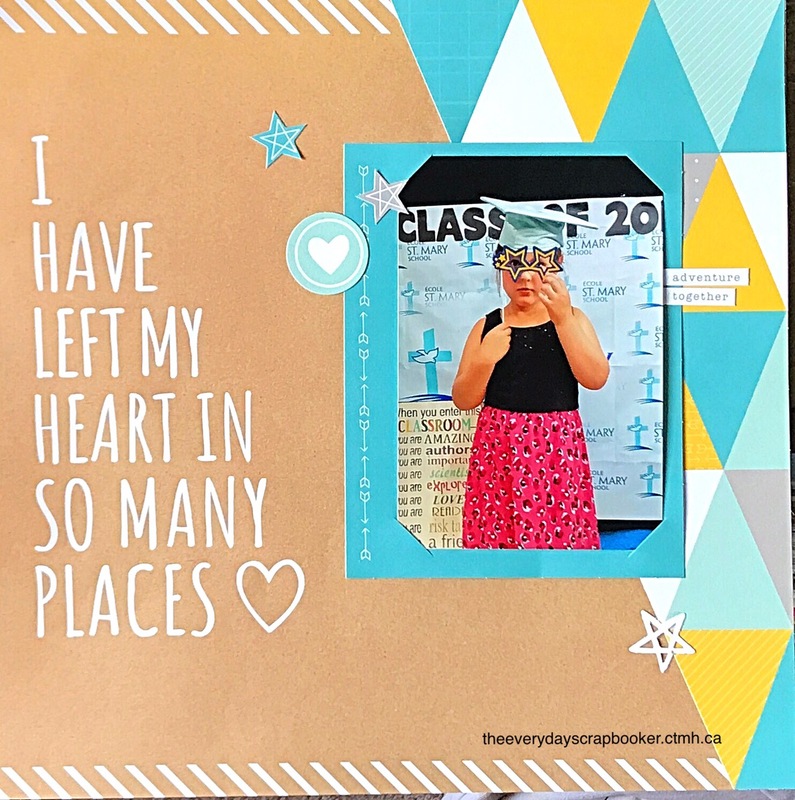 Also, purchase either of the The Story Begins baby boy or baby girl kits, and receive 30% off one of our scrapbook albums! This sale ends at 11:59 pm MST TONIGHT, so don’t miss out! Hello friends, welcome to Thursday. How is your day treating you so far? I hope its a good one for you! Its survival mode day for me, meaning I headed out for a walk, got home and bawled my eyes out (this year has been so tough…grieving hasn’t terminated yet. Actually, it never will. But, I’ll eventually learn to deal with it.) Then I got up, purged my daughters’ bedrooms (throwing out two garbage bags full of trash. Yeah, I know. The best part? I only cleaned up their dressers and night stands. My children are like their father- they have to keep every.single.thing. I’m a purger. I always have been. I don’t get the need to keep everything! My kids cry when I suggest donating toys they don’t play with and clothes they never wear. My husband gets downright mad at me for trying to sell things we rarely use and haven’t looked at in the 6 years we’ve lived in this house. The struggle is real, folks! Are you in the same predicament? How do you deal with it? Now, I’m binging on food and sitting in front of my computer attempting to type out a blog post. I hadn’t intended to start out my blog post that way, but there it is. No point in hiding behind my emotions. Its part of being human. And, part of grieving I suppose, too. (My children are going to be doing their own version of grieving when they get home from school and see what all I’ve thrown out.) I’m not sure I’m looking forward to it. I hope they don’t notice everything that’s gone. I thought I’d share a layout I created using the new Adventure Cut Above Layout kit. You’ll find this fun kit in the new Annual Inspirations catalog. If you’ve never used this kit before, and have no idea what I’m talking about, you’re going to like what I have to share with you. The idea behind this kit (and the card kits that come in the same line- Cut Above)- is ease of creating and simplicity. Images are included in the kit showing you what the traditional layouts and pocket style layouts could look like when you’re done creating. (I tend to follow what the pictures depict. I’ve always been a rule follower. When I bake, I need a recipe. 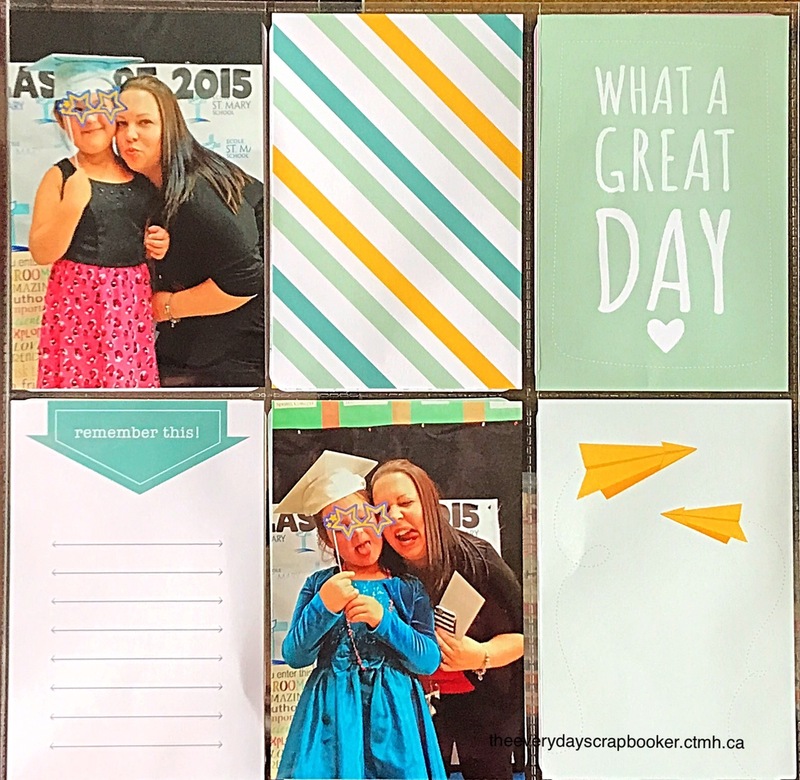 When I scrapbook, I need a template to follow. If I don’t have it, I’m totally lost and draw a blank. I can’t move on until I’ve been given direction.) The card kits and layout kits are super simple to put together. All the materials you need to create either project is included in the kit. They’re also pre-cut so there’s no fussing and guessing what size icons and elements should be. They are also a breeze to assemble- the cards and layouts themselves will literally take you no longer than 10 minutes from start to finish. So, if you’re into speed scrapbooking, for any reason, this is the route to take! All the kits come in different themes- there’s baby boy and baby girl ones, Adventure (as in travel), like the one I played with, and more. Head over to my website to have a look! Which is your favorite? The best part about these kits?! They’re affordable AND there’s always odds and ends left over for other projects! How cool is that? Pick one of these bad boys up for just $19.00 CAD. 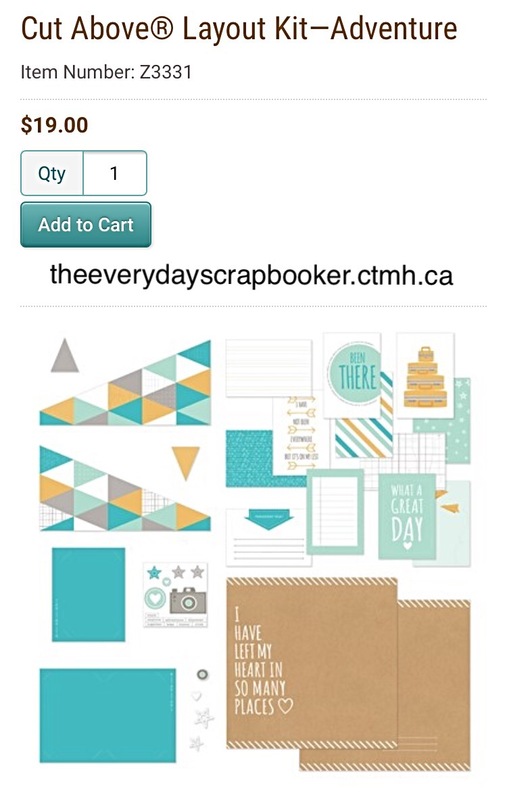 (The card kits are typically $9.00 CAD, not including the cost of shipping). Above is how the kit looks when it arrives on your doorstep. Below is how it could look after you’ve played with it some! I like to combine a traditional layout with a pocket style layout when I play with these kits. The only struggle I have with the pocket style pages is that I have to fill the backside of the page protector with pictures of the same orientation as the front side (Side A). Often, the pictures that follow the first ones aren’t the same orientation! I don’t have a picture of it, but in this particular case, I got smart, and just filled the flip side (Side B) with journaling cards, and moved on to whatever I wanted to scrapbook next. It bothers me that I couldn’t utilize that space the way I wanted, but I’m relieved it isn’t wasted space. There’s my silver lining! Thanks for joining me today! 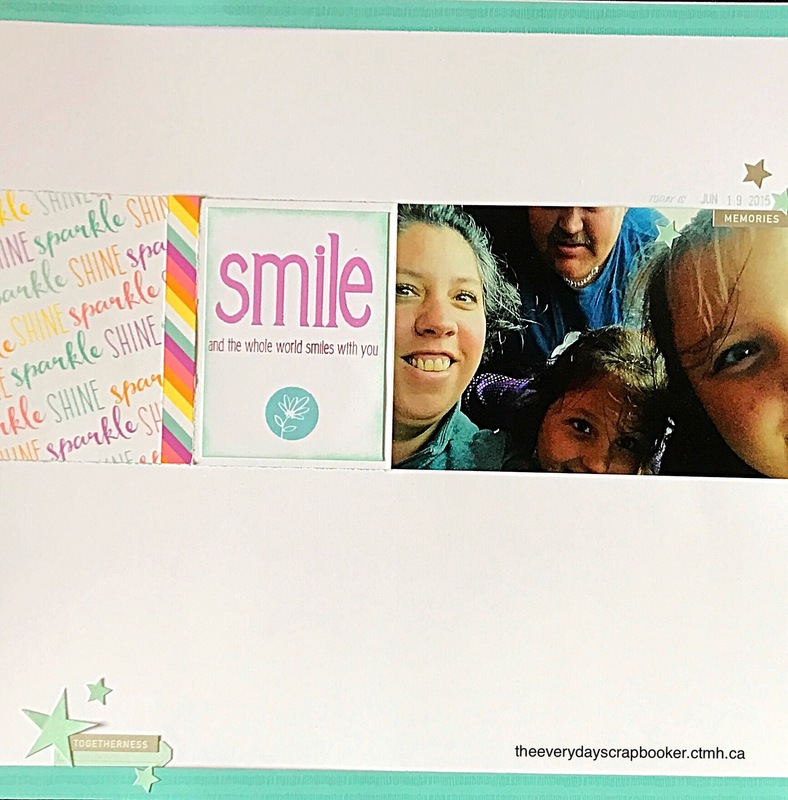 I’ll be back again soon to share a sneak of the Holiday Expressions catalog (which happily arrived on my doorstep yesterday) and a special project I’ve been working on!